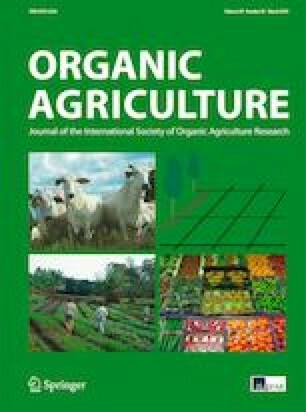 This study aimed to access the commercial and the sensorial quality of the “flat peaches” variety grown in three farming systems: conventional and organic (“with compost” and “without compost”) in Gafsa, located at the south-west of Tunisia. Tests were performed on 18 and 22 ripe fruits randomly harvested at full maturity stage based on morphological and chemical traits according to peach descriptors and to some previous fruit analysis. Highly significant differences were noted between the three farming systems for some peach morphological characters. According to the peach descriptors, the organic peaches (“with compost” and “without compost”) had a good attractiveness (7) and very firm flesh (9) compared to the conventional ones (3 and 5, respectively). The highest mean fruit weight (89.3 g) was obtained in organic cropping system “with compost.” A significant difference between cropping systems was noted for the majority of chemical parameters. The juice percentage was higher in organic fruits (≥ 55.0%) than in conventional ones (> 43%). The soluble solids content and the total sugars were the highest in organic peaches “without compost” (13.5 and 11.8% Brix, respectively). In organic peaches “with compost,” the titrable acidity and the total acidity were high (73.5 meq/l of juice and 0.4%, respectively) and the ripening and the sweetness indexes were low (0.1 and 1.6, respectively). The increases in the titrable and total acidities were concomitant with a decrease in juice pH values. The titrable acidity was significantly and negatively correlated with the ripening index (r = − 1.0*). This latter was also significantly and positively linked to the sweetness index (r = 1.0*). The organically grown peaches exhibited the highest quality traits (attractive, firm, big, juicy, etc.). Peaches were acid when grown organically system “with compost” and sweet “without compost.” These results may incite more the Tunisian farmers to produce organic peach and to develop more this agricultural system in Tunisia. The authors thank Mr. Wadhah Guenimi for his help in the various analyses. Also, they acknowledge Dr. Chokri Bayoudh and Dr. Mejda Daami, from the Regional Research Center on Horticulture and Organic Agriculture-Chott-Mariem, for manuscript revision; Dr. Ikbal Chaieb, from the Regional Research Center on Horticulture and Organic Agriculture-Chott-Mariem, for his kind help in the statistical analysis; and the anonymous reviewers for valuable comments and suggestions.